Theresa Xu ’18 explains how UR Consulting Group helps people on both the UR campus and the Rochester community. University of Rochester Consulting Group (URCG) is a student-run pro-bono consulting group available to all undergraduates from any major and any year at the U of R. Our meetings focus on interview preparation, career workshops, and professional development to assist our members in their goals of obtaining their ideal internship or job. 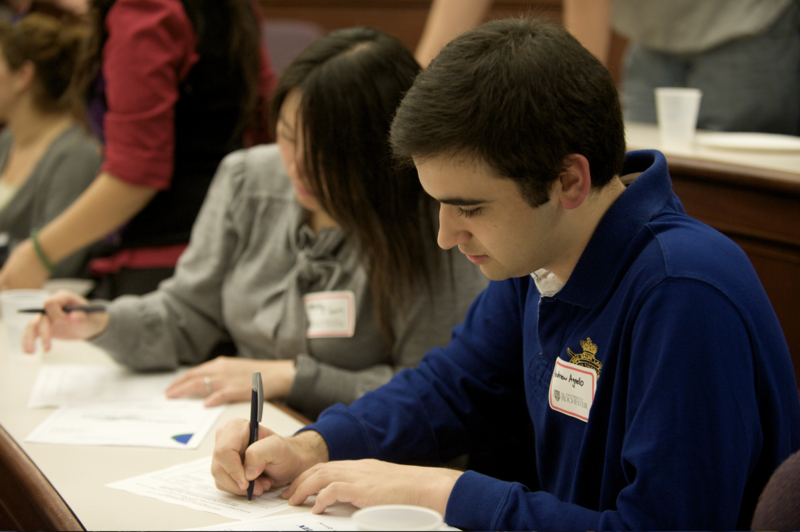 Last semester, we held a “Common Mistakes in Interviewing” workshop and a “Case Study Preparation” workshop that discussed firsthand experiences interviewing for different companies, detailing what was successful and what wasn’t. To determine what our meetings are centered around, we survey our members at the beginning of the semester to cater to their interests. We provide them the options of public speaking, panels, resume workshops, or anything else they might want to see. Aside from our bi-weekly meetings, we also have engagement projects that our members can apply to be a part of. These projects allow our members to gather a glimpse inside what working on a consulting project with a team in the real-world is like. The teams have around 5 members each that work with a client to solve a specific problem the client has, whether it be strategy and operations or marketing campaigns. We believe that we provide knowledge and a unique perspective that can benefit our clients who are seeking help. Last semester, we had the privilege of drafting marketing proposals and strategies for Brue Coffee, College Truckers and College Town. 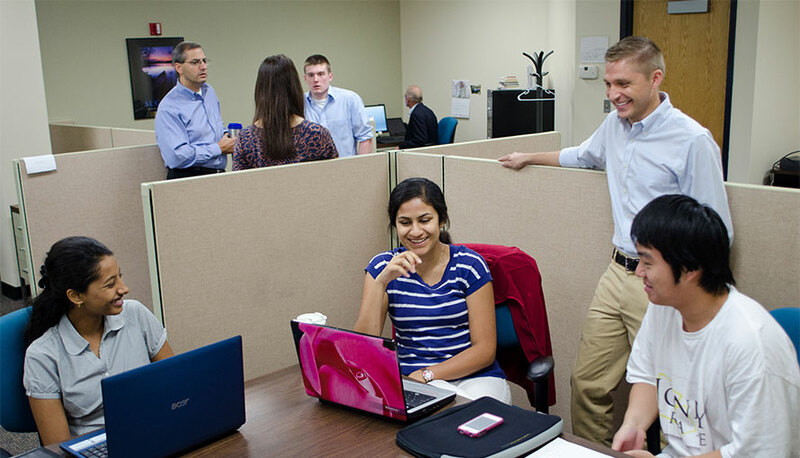 Although we are considered a consulting club, our organization benefits anyone who is interested in developing their leadership abilities and teamwork skills, which is essential for any career path. By gathering first-hand experience working with different clients, we believe that our members are even more prepared for their respective futures in any industry. For the upcoming semester, we have some exciting plans and events to offer to our members. We hope to host a Case Study Competition where our members work in teams to solve intricate problems and present their unique solutions to a panel of judges. This event targets and hones participants’ critical thinking abilities and creativity, which is an important factor in interviewing for the top consulting internships that typically conduct case study interviews. Additionally, in order for our members to have a better understanding of the career opportunities out there for them, we hope to invite students who have successfully completed summer internships in various companies and positions to present about their experiences to educate others. This serves as both a networking and learning opportunity for everyone. Meeting and contact information can be found on CCC! Theresa Xu is a senior studying Financial Economics with a minor in Computer Science. Due to her involvement in URCG, she found interest in consulting and just finished her internship at Ernst & Young in New York City, where she will return after graduation. Sidhant Ahluwalia ’18, one of UR’s entrepreneurship club leaders, shares his tips for college entrepreneurs. To begin with, I’m not a nerd, I’m not a valedictorian, I’m just another college student with a dream to make a living after graduation. Over the next 5 to 10 mins, I’m going to take you over my story of what I did in college to make the most of my time. Below are 8 steps I took to get to where I am today and by the end of this, I hope to inspire you to find your steps to make a successful college career. Over the summer of my sophomore year in college I picked up on iOS dev, a skill not many people have a great understanding of. Being able to code in swift and learning from taking a summer course and youtube videos prepared me for my first internship at a tech startup. Getting involved in a new startup is an experience you can’t replicate - it’s like working on a group project with a 24-hour deadline, all the time. Let’s say “intense” is a modest word to describe it. Skills such as App Development can and are being used by most firms/startups and being able to master such skills will differentiate you from the crowd. Not only do skills such as these help you get experience in the corporate world, but it also makes you self sufficient to start your own business. Take an entrepreneurship (ENT) course. As much as people value a technical background, having the necessary soft skills - such as communication, working with partners and getting through failures - are things people aren’t experienced with; trust me you want to get this out of the way while you’re in college. Learning about making business plans, financial plans, executive summaries and selling your ideas in college is the best platform to build on these skills. The buzz words count, industry terms can make or break a pitch, MVP, Disruptive Tech, value proposition and Lean startup are a few of them, add them to your dictionary now! Always have a side hustle. As busy as college gets, remember why you’re here. Is it for the parties on Friday nights? The mixers on Thursday? The hangover Sundays? Be focused, have a project that you’re passionate about, take it outside your class time and make it happen. It’s important to work on things you care about to know the impact you can make to the world, so go ahead, find a problem and solve it. For me I used college as a giant inflatable, anything you do in college is like doing something on the side. Find people that contrast your skills, something I learned along my journey is that we are around people that like the same things that we do. If I’m good at programming, it’s highly likely that my good friends will be good programmers as well. Think about it, when you want to start a business, you want to have a CEO, CTO and CFO - would you want your c-suite to be full of people who all think alike, who can basically program anything? No, right?! You want a diverse set of people that bring in different perspectives and skills to the table. This step is crucial to success, so go ahead and expand your circle. Be it a business or building a community, make it big! For me building a community was what mattered the most; building a community of like-minded people can make big things happen. After all, you’re who you surround yourself with. Founding a club usually just takes a few people and a statement of interest. If there isn’t the community, go make it... that’s what entrepreneurs do. The same goes for a business, and the single most important purpose of a business should be to get known. If you don’t make it big it doesn’t count! Running an organization can be challenging, but you’re not on your own: use tried and tested methods to build on (you don’t have to reinvent the wheel). Find what students at your university care about. Is it working on building products? Learning about how entrepreneurship is applicable in different fields? Something other than that? Make sure you’re targeting the right audience, as this is a very important step for building the community. Make sure you’re not providing a service that already exists - create something new, fill in a new niche. You’re not an entrepreneur if you don’t know how to raise money or pitch a project you’ve been working on. Being a VC may have been a dream in the past, but in today’s date people are encouraged to try become campus partners for VC firms. This is a great way to meet entrepreneurs and like-minded students. Dorm room fund, Rough Draft Ventures and tons of other venture capital firms are made to fund startups out of college dorm rooms. I’m personally involved with GroundUP ventures and I can say for sure that it has given me the opportunity to network with people from all around the globe to talk about things that interest me. I can assure you that you’re only restricted to the limits you set, college dropouts have made some of the biggest companies we know today, one of such has over 2 billion users. Believe in yourself and make it happen - set those ground rules and the rest will follow. These steps aren’t a roadmap to having a successful college career. I believe everyone has to find their route, their calling and this is how I found mine. Sidhant Ahluwalia is a member of University of Rochester’s Class of 2018. He is working toward a Bachelors of Arts degree in Computer Science, track in HCI. A student in the Hajim School of Engineering & Applied Sciences, Ahluwalia is also a campus partner for GroundUP Ventures and co-founder of Meliora LaunchPad, an entrepreneurship club for innovative students. This upcoming semester is going to be a busy one – check out what we have planned! Ready to test the entrepreneurship waters? Browse a selection of innovation-themed articles and find inspiration. Wondering if entrepreneurship is your thing? Curious about the innovation process? Interested in learning more, but hesitant to jump head-first into an Ain Center event? We are here to help you try activities outside your comfort zone and to introduce you to a new community that can challenge your perspective and encourage creative thinking. Here we have pulled together a list of ten articles about entrepreneurship and innovation, all hand-picked to inspire interest and excitement. As you read through the pieces, you will learn about the characteristics and facets of entrepreneurship. 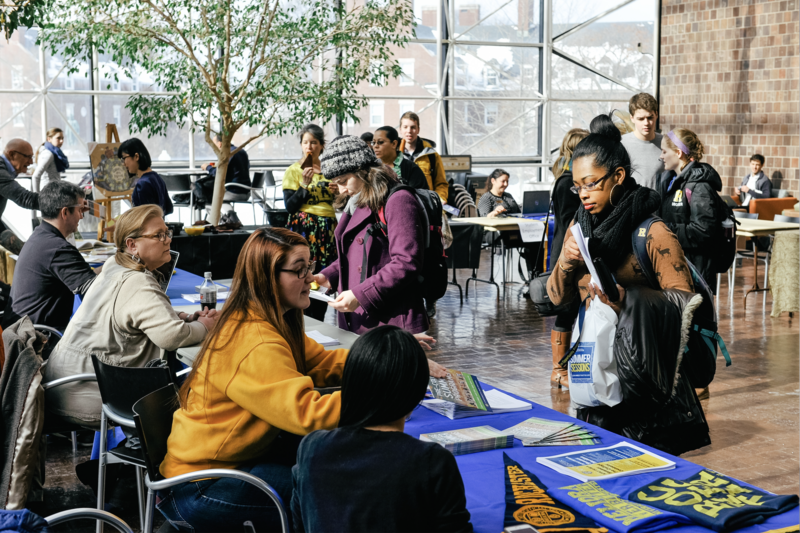 The first four showcase recent University of Rochester entrepreneurs, while the rest put them in context of the broader enterprising community. Select just one that stands out, or take them all in – we simply want to give you a glimpse of how awesome entrepreneurship can be. Class of 2017 members Edgar Alaniz, Carlos “Yuki” Gonzalez, Ibrahim Mohammad, and Omar Soufan are featured in this U of R publication. This team’s goal to aid refugees across the globe inspired their business plan: build homes for displaced peoples, using LEGO-style bricks made from recycled plastic. 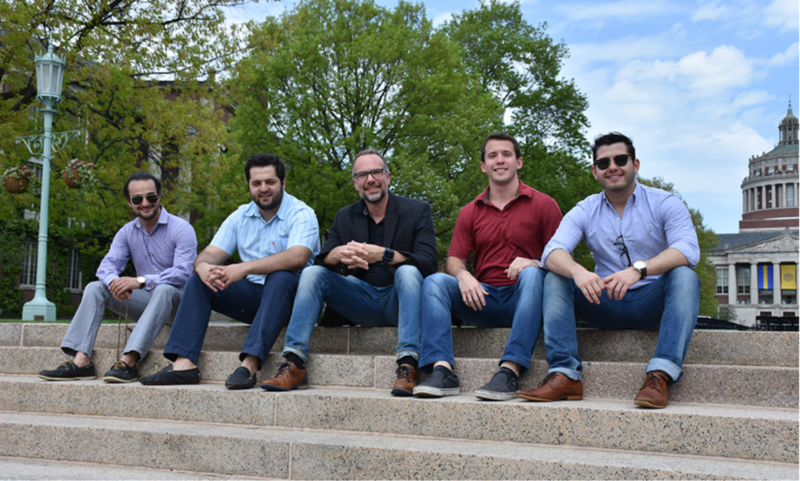 After tying for the top prize in the 2017 Mark Ain Business Model Competition, they competed for $1M in the Hult Prize Competition – finishing among the top eight out of 50,000 entries worldwide. Here, a recent alum discusses the ventures he worked on during his time at U of R. Kallel, who won the 2017 Charles and Janet Forbes Entrepreneurial Competition in May, is participating in the current e5 (formerly KEY) year – an extra tuition-free year that allows students to pursue an entrepreneurial project. Social entrepreneurship is growing, as evidenced by the variety of culture-conscious projects coming out of U of R. This one, Oasis Foods (formed by ’17 MBA grads Kat Cook, Fahria Omar, and Sarah Spoto), provides healthy meals to communities in need. Created during a course at the University, Oasis shows how projects can take on new life outside of the classroom. Alums Morgan Sinko ’16, Jordan Brooks ’16, and Lucian Copeland ’16 founded NullSpace VR (now Hardlight VR) during their time at the University of Rochester. Their passion for virtual reality recently led them to Seattle – this article explains their journey to the west coast from the U of R and provides an overview of their feature product. Carl Richards begins this piece by firing you as your own worst critic. Sounds a little funny, right? As he goes on, he argues how important trusting your work is, as well as allowing others the opportunity to decide what works and what doesn’t. Try your best and be a little fearless – in entrepreneurship, this advice is key. Celebrating and encouraging female entrepreneurs is as important as ever. In this article, Vicki Saunders explains the “Act of Radical Generosity,” created to assist women innovators with financial support. Already taking place on the west coast of the US, the leaders of this initiative plan to expand around the globe. A peek inside the Student Incubator at High Tech Rochester, a space where students gain resources and training to run a successful venture. Not focused on “entrepreneurship,” exactly, but these tips can help anyone become a better conversationalist. Entrepreneurs have to be able to share their ideas with a variety of audiences – this article is sort of a cheat sheet for engaging with others, even in usually-awkward situations. 2017 was certainly a year of change. Looking to the year ahead, author Billee Howard lays out a few things that entrepreneurs should keep in mind as we move forward. Given top priority on the list? Embracing self-reflection and harnessing the ability to ask the tough questions, even when you may just want to plow ahead. Innovative ideas are wonderful, but they need serious thought to make an impact. The article above stresses thoughtfulness. In this piece, Jessica Stillman offers a list of ten heavy, but insightful questions for anyone looking to make a change in 2018. Though these may seem a bit far-off if you are still a student, long-term thinking can guide you down the right path. For many years, critics have wondered if entrepreneurship can be taught. The author uses this list of traits to point out that, while some of these characteristics are innate, most are teachable and can become habits over time. Ready to get to work? Find our information below! 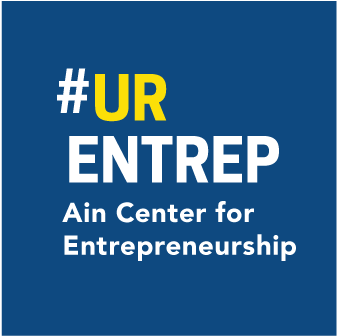 Now that your interest is piqued, come visit us in the Ain Center for Entrepreneurship (1-211 Carol Simon Hall), send us an email (AinCFE@rochester.edu), or give us a call (585-276-3500). We offer a variety of services that help with each stage of interest: envisioning your project, exploring options, building solid framework, and launching your venture. We can’t wait to help you move forward.